Against the marked approach Black's diagonal response at is simple, and good for territory. Now White at can be considered still to be the standard answer, but extending as far as a is increasingly seen in pro play, for a lighter position. 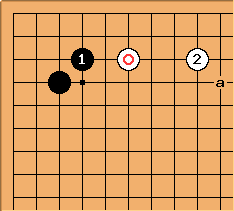 The result in the diagram is locally considered good for Black, but White normally plays this approach when a black pincer on the top side would profit black even more. The difference between and White a needs further elaboration. 34 point distant low approach's statistical analysis.